Do you have a table tennis question? Have you got a table tennis question which is of interest to you AND other visitors to this site? Well if you have, you can ask me your question right here. If I've not covered your question already and it's of interest to others, I'll answer your question and add it to the list below. Table tennis has been my passion now for over 40 years, so if you can't find what you need to know, right here on my web site, just ask me your table tennis question and I'll do my best to answer it for you. Is it legal to use a sandpaper covered racket? 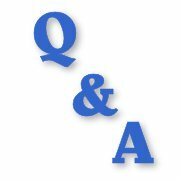 I have a question regarding the validity of the racket used by penholders. What's the difference between types and colours of rubbers used? Can I use the side without rubber (but with colour) to volley the ball? What happens if I hit the racket on the table? Can I change the ball or racket during a match? When you are serving, do you have to send the ball in between your opponent's corners of the table? I thought that there was a rule about not stamping when serving? When you have game point, is it automatically your opponent's serve or can you win a game by serving? Who would win the point if the ball bounces once on my court and two times on my opponent's court? What happens when the ball hits the outside edge of white line or the edge of the table? How many times can you re-take the serve when the ball hits the net and bounces on my opponent's side of the table? Who wins the point when the ball spins back over the net without the other player touching it? Can your opponent who is returning your serve have any part of his body over the white line or edge of the table? Is there any rule which covers when a player calls out or shouts out during a rally? Is my opponent allowed to hit the ball on my side of the net? What happens when my opponent's glasses come off in the middle of a rally (at a crucial point in the game). Am I allowed to touch the table during a rally? Is it OK if the ball hits the net post and then bounces on the opponent's court? Also, is it OK if the ball hits the top of the net twice? What happens if the ball touches the side (not the corner) of the table? If the ball is damaged during a rally, does that constitute a let or is the winner of the rally entitled to claim the point? What are the rules for game point? Is there any maximum time limit or scoreline if the deuce stretches into say a 20-20 scoreline situation? How will the umpire decide if a player injured the opponent? What are the rules about continuous play and time outs because I cannot find any reference to this in the rules? Can coaches give advice to players in a league match? When a yellow card is given, how long does it last for? How do you calculate the group rankings in a competition? What type of racket and rubbers would you recommend for me? What type of racket would you recommend for a gift to someone? What table tennis tables do you recommend? Can I convert an indoor table to an outdoor table? I wish to restore my 15 years old professional grade table tennis table. What is the specification of the paint and where can I buy it? I am a penhold player so what should my position be while smashing? Once you reach a certain level, is it best to loop or try to drop it short if you're using smooth rubbers? How does one become an official in international table tennis tournaments? Can you please tell me who are the officials in table tennis and their duties? What is the call that professional players make after winning a point? It sounds like "cho" or "choi". Is it Chinese and what does it mean/translate as? I would like to know what would be the minimum height for a home table tennis room. Who was the last English lady to win the title of European Champion?